The Yoga Mala Foundation is a non-profit organization which aims to raise funds and awareness to help spread the benefit of yoga to communities and individuals in need. Think Up! was happy to work with Dawn and Jason at YMF to define the brand for this new foundation. Building growth and community into a brand identity was important for an organization to unify yoga schools throughout the large city of Montreal. 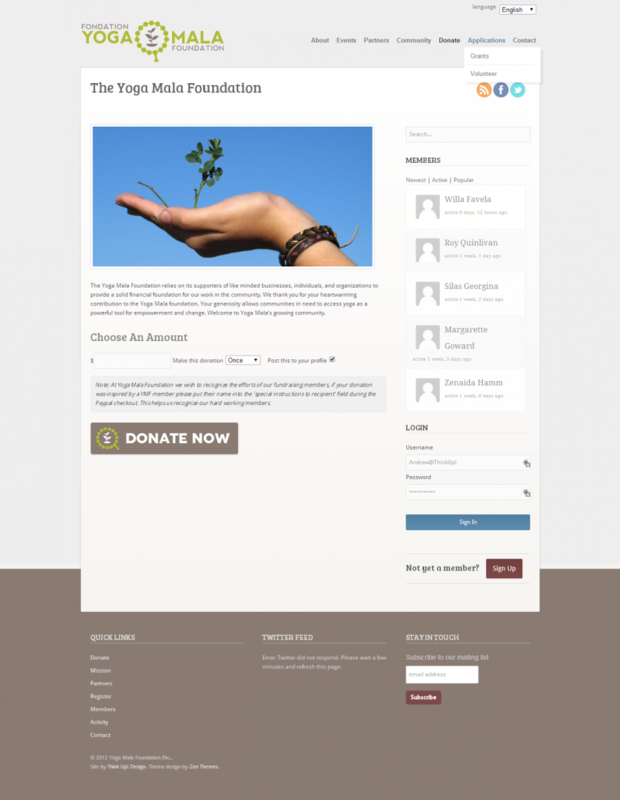 Once the logo was complete, a responsive web design was developed and implemented in WordPress and integrated with Buddypress to help build the online community of members which help sustain the fundraising efforts. Online fundraising, with goals, donation tracking and integration with Paypal was also implemented. A powerhouse for change and growth in the Montreal yoga community was born.